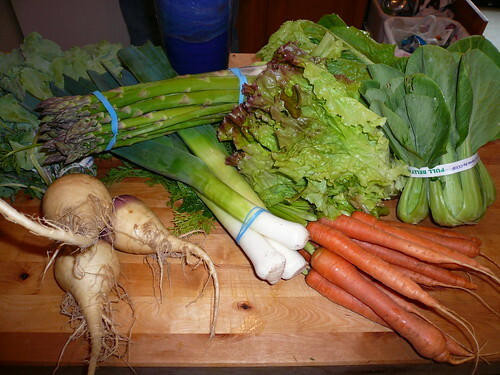 So I said that I would blog about anything good we made with our CSA. 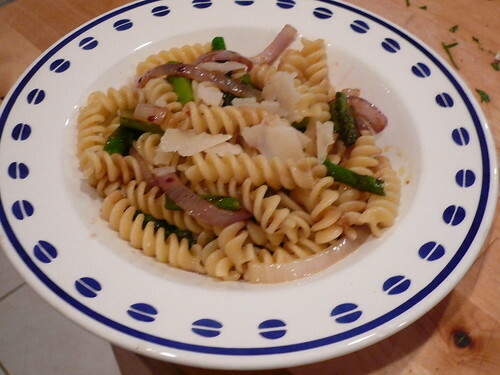 I got an email from America’s Test Kitchen a couple of weeks ago for a recipe for Campanelli with Asparagus, Basil, and Balsamic Glaze. Evan first attempted the recipe a couple of weeks ago, but accidentally over reduced the balsamic glaze,which he didn’t realize until after he had added it to everything. We ended up with salad that night. Evan attempted the recipe again last night. I am so glad he did, because it was soooo good. He did end up leaving out the basil at the last minute because the stuff we picked up at the store was bitter, but the pasta was great without it. Evan said that it was really quick to put together. Nicole over at Sitting Still was kind enough to interview me for her old skool meme. I’ve actually been reading her blog for quite awhile, but nearly never comment. Google reader, my great new love, makes me a very lazy commenter these days. 1) Your “About” page states that you are not a cat sweatshirt person. What kind of sweatshirt person are you? Hmmm…I am not a sweatshirt person in general. From childhood, I have always under dressed for the weather. When I was six or seven I nearly froze to death walking to school in a snowstorm wearing a dress. (I always wore a dress in early elementary school. If you wore a dress, you got to be the mom when you played house. If you wore pants, you had to be the baby. Since, even then, I liked to boss people, I always wore a dress.) On our trip to Point Reyes last weekend I wore shorts and a t-shirt, while Evan and Rob wore long pants and long sleeves. Evan brought along a sweatshirt thing because he knew I would be cold, but wouldn’t bring my own coat. He’s good that way. Sooo, I guess I would say that I’m an Evan’s sweatshirt sort of person. 2) You knit. A LOT. My goodness, my fingers are tired just looking at your project list. What advice would you give to someone (ahem, me) who has never knitted but is curious about it? Probably the easiest way to learn is to find a knitter willing to teach you. From what I know, most knitters love teaching other people to knit. We’re sort of like drug addicts in that way. If you don’t know anyone that knits, there is a good website with lots of videos called knitting help. My other piece of advice would be to start on a small project other than a scarf. Scarves, unless they have a fun pattern, are soooo boring to knit. It’s the same thing over and over again and they take forever. I keep offering to knit for friends and they always want a scarf. Bah. Another thing to do is to find a local yarn store. They are often full of people that are willing to answer beginner questions (if they aren’t…find another yarn store), they often offer classes, and host informal knitting gatherings, where you can meet more people that can help you with your knitting. One of the things I like most about knitting is that is an activity that is very portable. You can knit while you wait at the doctors office, on a car trip, or wherever. Plus I probably watch way too much television, so as long as I am knitting while I watch I’m doing something somewhat productive. The other thing about knitting is that you are making a one-of-a-kind item. I really love giving gifts to people. For the people in my life, it is an opportunity for me to make something for them that they know I put a lot of time and care into and it is a unique item just for them. This is why I do so much knitting for other people. 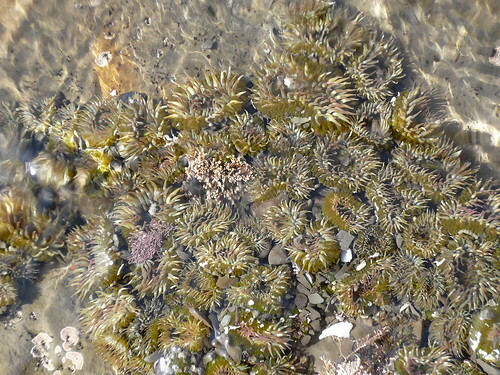 I find it very relaxing as well and a nice contrast to the sciency things I think about all day. 3) You say that you are a scientist. Would you call yourself a “geek”? Why or why not? I wouldn’t call myself a geek, but I just called my husband (he’s visiting a friend in Texas for the weekend) and he tells me that I am a geek. We’ll see if I actually pick him up at the airport tomorrow. 4) Name five ‘luxury’ items that you could not live without. My DVR, sock yarn, ice cream, my wedding/engagement rings, a library card. What’s that you say? A library card isn’t a luxury item? Well, if things continue to go the way they have been going, it soon will be. 5) Thong, bikini, brief, girdle, commando, or other? Explain. I have been a bikini wearer since childhood. In kindergarten, I actually brought my days of the week Garfield bikini underpants for show and tell (the whole package, I didn’t show underpants I was actually wearing). My mom had really horrible morning sickness around this time, so she had a neighbor take me to school in the morning. She was often mortified with what I was wearing when she came to pick me up at the end of the day like my pink bathing suit with a red skirt from my cheerleader Halloween costume, brown knee socks and about a bazillion barrettes in my hair. That is how I got away with bring my underpants to school. Leave me a comment requesting an interview. I will email you five questions. I get to pick the questions. BWAHAHAHAHA. You will update your blog with the answers to the questions. You will include this explanation (or a reasonable variation) and an offer to interview someone else in the same post. I’m not sure I ever got around to posting about Project Spectrum related projects during the last set of colors (although I finished my blue Samus cardigan specifically because of project spectrum and then neglected to blog about it. Look for it in an upcoming post). 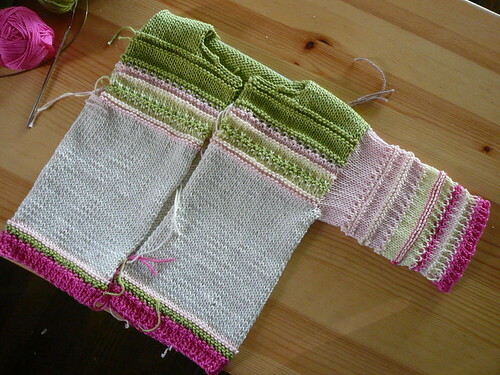 As I was working on this baby cardigan the other day, however, I realized it is the perfect undertaking for the current project spectrum colors, pink, yellow, and green. In case one doesn’t recognize it, it is the Cecilia cardigan from Knitty. I’ve googled around and I haven’t found a single person that has knit it true to the pattern. That’s unfortunate as it is quite a fun knit. It’s smartly designed (at least for me) in the fact that there is pretty much no seaming. I’ll pick up stitches and/or kitchener any day if it means I don’t have to seam. Plus, it has the added bonus of putting the Simon and Garfunkel song in my head every time I work on. I hadn’t really been exposed to Simon and Garfunkel music before my sophomore year of college. Once I heard the song Cecilia I was hooked. 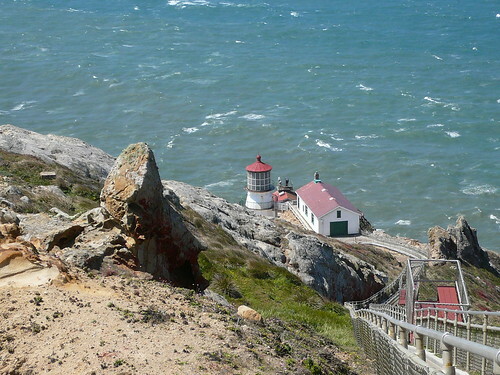 As I mentioned in an earlier post, Evan and I went with a co-worker on Sunday to visit Point Reyes Lighthouse. 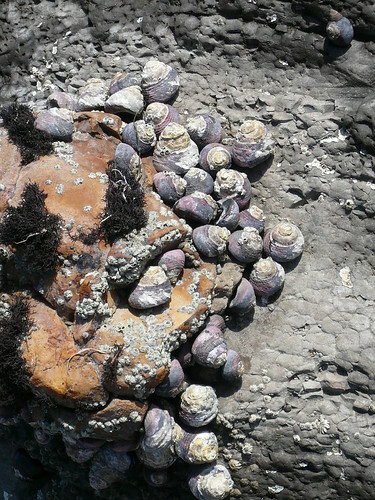 We’d been to the general area before, but had never made the trek out to the lighthouse. The winds that day were crazy, so they had shut down the stairs to the lighthouse for safety. This is as close as we got. While visiting the lighthouse Rob and I saw a whale, but Evan didn’t see it. Evan considers himself quite the Beastmaster, so it a bit of a blow (ha, ha) to his wildlife-spotting ego to have missed the whale. 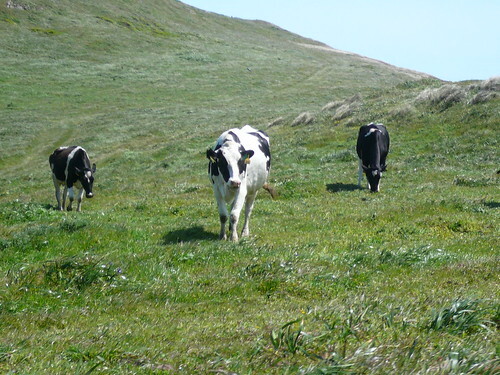 Unfortunately, I didn’t get a picture, but I did take some shots of some of the other creatures of Point Reyes, like cows…. We’ve been such slugs for so many weekends that it was really nice to get outside, enjoy the sunshine, and breathe that new spring air. 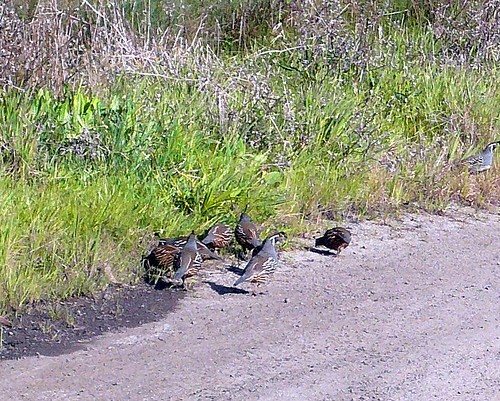 Evan: In a couple of years, Point Reyes could be completely gone. 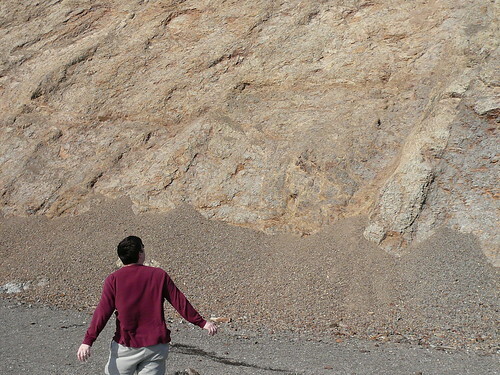 Evan (as he turns to throw another rock at the crumbling rock wall at Agate Beach): Yeah, if I work at it hard enough. I’ve been knitting quite a bit lately, but haven’t been blogging about it. 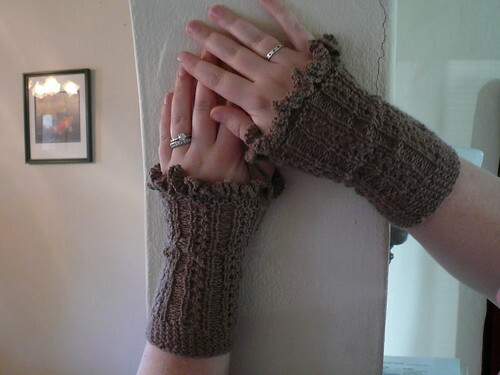 This past Sunday, I took the fingerless gloves I had been working on along on a car trip to Point Reyes Lighthouse. I didn’t quite finish them in the car (have you ever driven on Hwy 1…it’s sooo winding), but was able to cast-off the last stitch during Sopranos later that night. It’s not quite the season for them anymore, but I am quite pleased with how they turned out. They are oh, so, soft. The yarn and the pattern were both a gift from the wonderful Crafty Kim in the KMKS. Thanks again, Kim! While Evan generally does all of the cooking in our house, I generally have to make the decision as to what we are actually eating. Otherwise, we’d eat burritos or grilled cheese every night. After reading about the awesomeness of CSAs all over the internet, last week we decided to join a CSA, Fully Belly Farm. We were super excited on Saturday morning to pick up our first delivery. The produce we got is awesome…all organic, super fresh and tasty. We’re really enjoying getting to eat such a diverse mix of veggies. For a bit more each week, our CSA provides us with fresh cut flowers. 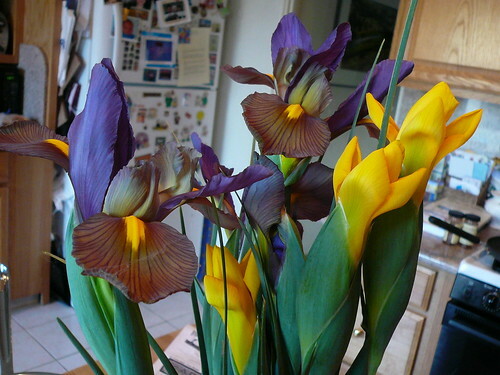 We got some irises (we actually get to pick which flowers we want at the pick-up site, which I think is really neat) and they are quite lovely. 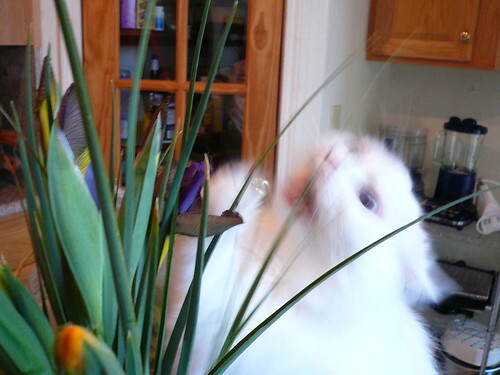 We have to keep them (and all flowers) on a high shelf most the time, however, or this happens…. When we come up with new dishes to celebrate these great veggies, I’ll try and blog about them. So far, we’ve had a couple of great salads and pot roast with rutabagas and carrots. Tonight we’ll eat the asparagus and tomorrow Evan is making stir fry with the tat soi. Yum! Also, our CSA sells yarn. How cool is that? Long time no blog, huh?